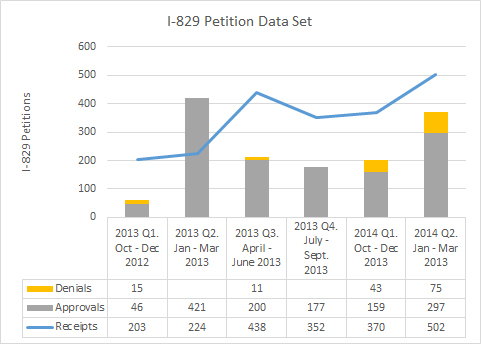 The USCIS Immigration and Citizenship Data page has been updated again with data for I-526 and I-829 Petitions processed in the second quarter of Fiscal Year 2014 (January to March). Once again, here are my little charts illustrating how the numbers compare with previous quarters. 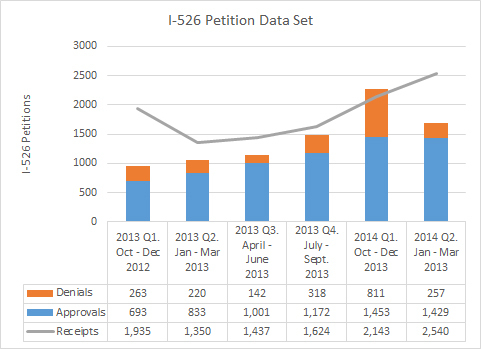 I-526 processing volumes show modest increase overall, but below last quarter’s spike and still nowhere near Mr. Colucci’s goal of having the number of processed petitions at least exceed the number of petitions received each week. I-829s, on the other hand, flew off the shelf in Q2 – maybe because they’re all the California EB-5 team has to work on as of February? We’ll see how the processing story continues to unfold in coming quarters. The USCIS Regional Center list continues to expand by leaps and bounds, reflecting hard work by the USCIS Investor Program Office and adding to a crowded field. We’re continuing to see many multi-state RCs and many RCs associated with operators who control multiple RCs.